Omaha poker is very similar in format to Texas Hold'Em. Both of these games have 5 community cards that the players share, trying to make the best hand possible from the “board” and the cards they are dealt to win the pot. However unlike in Hold’em where players receive two face down cards, in Omaha players are dealt 4 “hole” cards. The main rule to take note of, and what often trips up players trying their hand at Omaha who are more used to Hold ‘Em is you must use both of your hole cards with three of the community cards. Therefore if there are for instance 4 hearts on the board and you hold a single heart in your hand you actually do not have a flush, as you are only be able to play three of the community cards and would need two hearts amongst your hole cards to complete the flush, yes even if it is an ACE in your hand! Also in Omaha poker, you are unable to play “the board” using all the community cards and none of your own individual hole cards. In all circumstances you are always using two from your face down hole cards and three from the board. Within the poker community, Omaha is often referred to as either NUTS POKER or even LOLmaha! Due to the increased level of action and the fact is very often “the nuts” (the best possible 5 card hand, considering the community cards dealt) which wins the pot. If your making your first steps into Omaha don’t be surprised when you make the common winning hands in Hold ‘Em on the flop say a flush, or three of a kind then ending up losing to a “boat” (Full house) by the river. 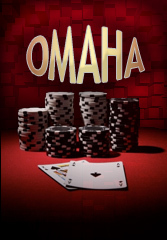 Once you get to grips with this variation of poker you can start to explore all the variations of Omaha itself! The most common being the game being played “pot limit”, so no “All Ins” possible to scare of your opponents from chasing their draws ala Hold ‘Em. You may also play Omaha Hi-Low(also known as 8-or-better Omaha) In this variant you can win half the pot with the lowest 5 cards possible! (as long as it is a 5 card combination of ‘8 high’ or lower), and of course the slow but steady “limit” games. As Omaha is so popular now, especially as it forms part of a H.O.R.S.E tournament (a tournament whereby players switch each round between 5 popular forms of poker) PokerStars offers all variations of the game in their popular poker tournaments. The current popularity of Omaha can be put down to a lot of players enjoying the more action oriented games that can often be found, most players can make or have the potential to make a great hand almost every round. The best possible hands are considerably more likely with the extra two cards per player over what they would have in Hold ‘Em, especially at a full table where almost the whole deck could be in play! Many casino’s worldwide offer Omaha cashgames as a second option to the Hold ‘Em games. If you don’t have any in your local area you can play the game on PokerStars, where you can practice for free with fake/play money). Here is a clip of Gus Hanson playing ‘wunderkind’ Nicki Jedlicka headsup at Omaha poker online back in 2009. Keep in mind, these guys are actually playing pot limit Omaha for real money.